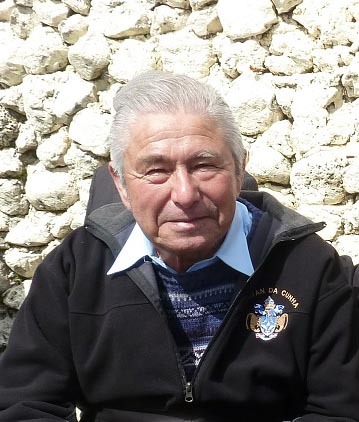 Obituary for Tristan da Cunha islander Barton Green, who passed away 6th March 2016, aged 83. Barton Frederick Green passed away on Monday 6th March 2017 after a long and debilitating illness aged 83. Barton was born on 13th September 1933, to parents Frederick and Alice Green. He married Pauline Glass in January 1958. He is survived by his sons Gavin and Keith, daughter-in-law Joanne, grandchildren Jason and Caryn, brothers Benny, James, Ken and Terry and sisters Martha and Francesca. Barton started his working life as a fisherman when the crayfish industry first started. He often told me of how they fished from small dinghies relying on oars to move about and of the amazing abundance of fish at that time. When the volcano erupted in 1961 Barton and his family lived in Calshot and he worked at the nearby Esso Oil Refinery where he was highly respected by his employers; he said that, on occasions he would be given a lift from work by the 'big boss' in a Rolls Royce! On his return to Tristan Barton worked full time for the fishing company where they employed his skills as a carpenter to build and maintain the fishing boats. On a fishing day it was Barton's responsibility to hit the dong having made crucial judgements about the weather and state of the ocean. He would then set out to sea in the launch and act as a sort of shepherd to all the fishing boats making running repairs and ensuring that they all got back safely to the harbour. My wife and I had many opportunities to join him in the launch and he would take us to excellent fishing spots by lining up marks on the island's coast where we would be guaranteed to catch a good number of bluefish, five finger and stumpnose. On these days his skills as a navigator and seaman were obvious. For many years Barton was coxswain of the longboat Stirling Castle and in March 1958 when the longboats returning from Nightingale were hit by a storm he successfully navigated back to Tristan on a night when two of the longboats were blown out of site of the island; Barton was very proud of this achievement. Barton was a very special friend to me and my family when we lived on the island in the 1980s. He and Pauline looked after us as though they were parents to me and my wife Sue, and Grandparents to our sons Barry and Simon. None of our family will ever forget Barton's kindness and generosity and I learned so much from him that has enhanced my life, everything from the best way to grow potatoes to shearing a sheep. Barton had a great sense of humour and occasionally liked to play practical jokes. On my first attempt at shearing a sheep Barton chose the liveliest creature he could and all those nearby enjoyed the spectacle of my feeble attempts at keeping hold of the beast while struggling to snip away at its fleece with the shears. Barton was a well respected member of the Tristan community who was always happy to help others and whose cheerful disposition brightened the lives of all around him. He will be greatly missed but leaves many happy memories for all who knew him.